Luxury custom homebuilder Harwick Homes has completed a 7,490-total square foot estate in Coquina Sands at 375 Yucca Road. 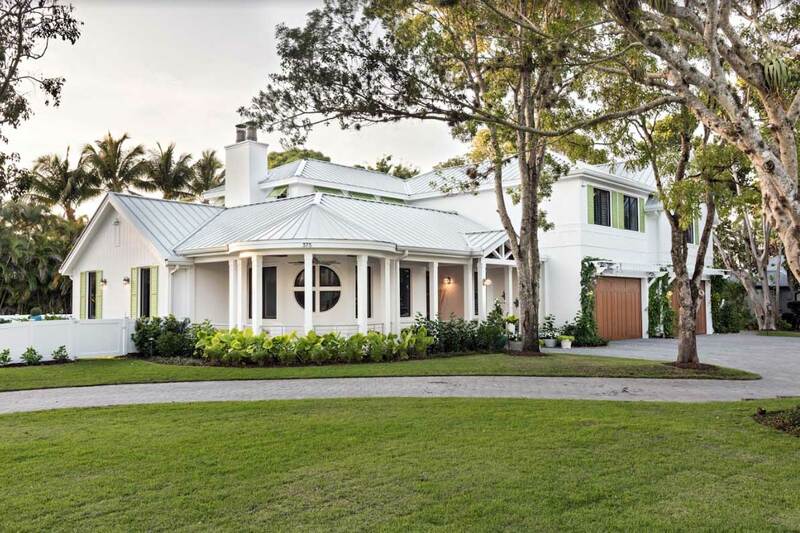 The four bedroom, three bathroom estate home is designed by award winning Naples architect Jon Kukk of Kukk Architecture and Design, with interior design by Sydney Sorenson and landscape design by Christian Andrea of Architectural Land Design. The interior color palette is white and crisp, with bright colors to accent throughout the home. Brilliant shades of pink, blue, and green add warmth to the immaculate property. This coastal contemporary estate home welcomes guests through rich dark wood and glass front doors opening to a bright foyer. A quaint wrap around porch and rotunda sit to the left of the grand covered entrance, and to the right is the spacious four-car garage. The foyer expands to the great room, featuring 32’ ceilings with exposed beams and reclaimed hardwood floors. Large double doors open from the great room to the outdoor living area. The luxurious outdoor living area of the home includes a covered lanai space featuring a dining area as well as lounge seating. The lanai is fitted with an outdoor grill and refrigerator. Past the lanai is the pool deck with steps down to the resort style pool. The large swimming pool is well lit and includes a waterfall feature. Stepping-stones and green grass comprise the well-groomed lawn surrounding the outdoor living space. To the left of the pool is a pergola, bringing a vacation feel to the space. “This estate is custom built down to the last foot. We are proud of our close attention to detail and are thrilled we were able to create our clients’ dream home,” adds Mark Smith, President of Harwick Homes. The living room to the left boasts a black marble fireplace with tiling extending all the way up the wall. Attached to the great room is the expansive chef’s kitchen. 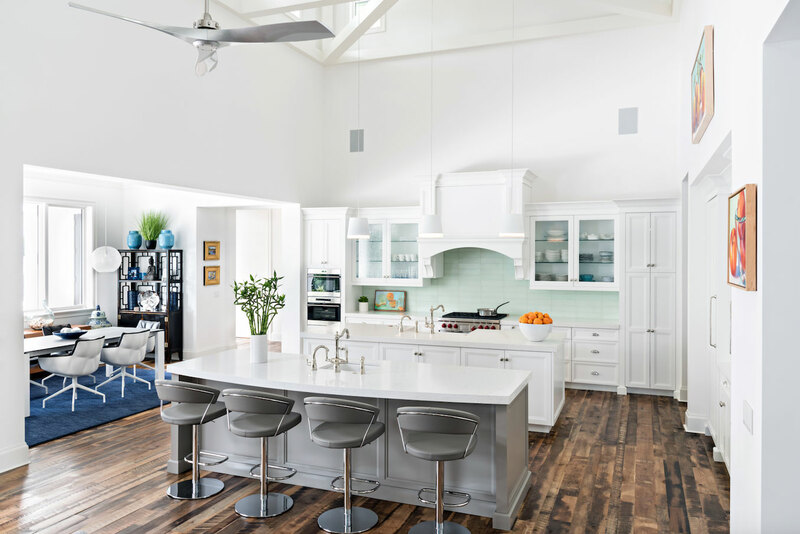 The crisp white kitchen includes two islands, both equipped with sinks and ample counter space. The kitchen is complete with Wolf appliances and custom all-white cabinetry. The counters are topped off with white quartz and clean silver finishes. The kitchen includes an open dining nook with views overlooking the tropical backyard and its expansive resort style pool. French doors in the great room lead to a private family room. The family room is fitted with electric shades making it easy to turn the space into a movie or gaming room at the press of a button. Vaulted ceilings leave a breathtaking impression. Sharing a wall with the expansive TV room is the first floor home office. The office is a key component of the home, decorated as a pink, white and orange oasis. 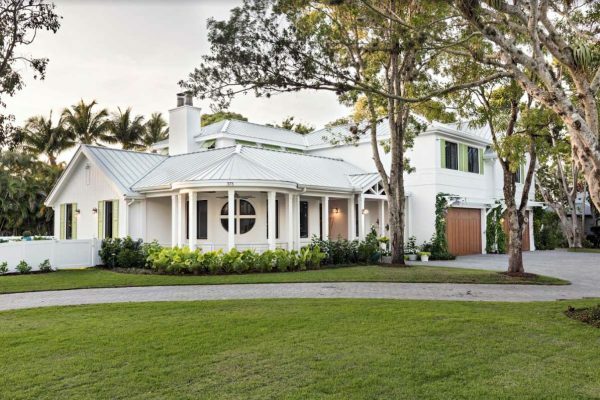 An oversized circular window overlooks the front lanai and rotunda with views of the front landscaping. The right wing of the home hosts the first floor living quarters. The first bedroom has a large walk in closet as well as an en suite bathroom featuring a large tub-shower. The bedroom has access to an attached playroom fitted with custom built in window seats. The playroom also opens to a vestibule off of the kitchen for easy access. The spacious master suite overlooks the outdoor living space and pool. The symmetrical master bathroom features a large freestanding tub flanked by his and hers vanities, wash closets, and showers. Two expansive his and hers closets are tucked away opposite the bathroom in the master suite. The master suite has both access to the outdoor lanai and living space as well as a conveniently placed dog run located along the side of the home. The second floor of the home includes a state of the art exercise room with reinforced floors ideal for high intensity workouts. Attached to the exercise room is a Jack and Jill full bathroom shared with the second-floor guest bedroom. A second home office and large storage space complete the second floor. 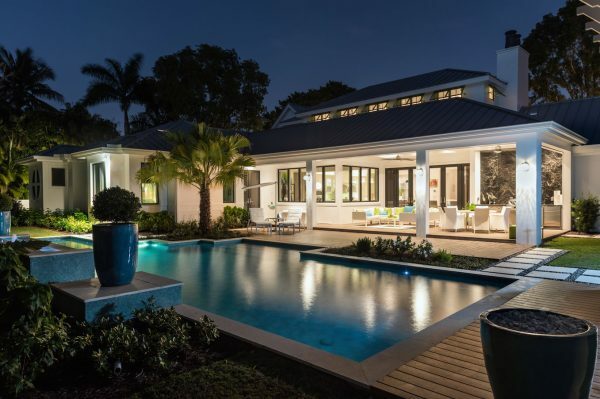 This Coquina Sands private residence epitomizes a Harwick Homes job well done.